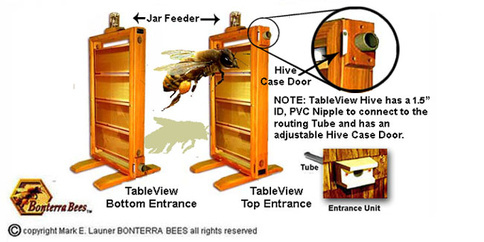 The TableViewTM observation hive is an economic alternative to our other models and is at home on a table or any supporting surface. 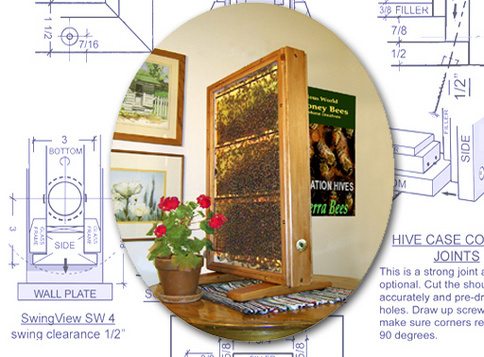 As with our other models, you will witness the amazing world of your honey bee colony. You will watch the queen inspect and select brood cells and lay thousands of eggs. Observe the nurse bees feeding those eggs and cap them, and, in 21 days, take delight in watching a new little bee chew away that cap, emerge to rub herself off and grow to become a selfless, hard working member of her colony. Just imagine watching all of the marvelous activities that happen in your Honey Bee colony. 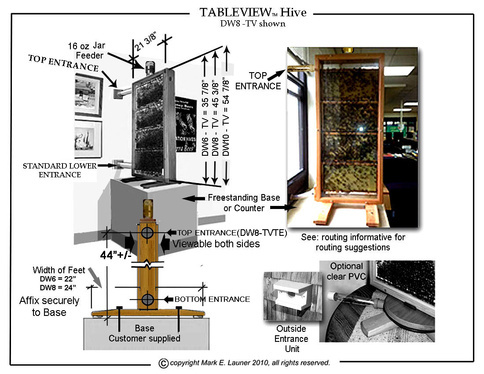 To remove the TableView Hive Case to the outdoors for servicing; close the Hive Case door and remove the Hive Case from the routing pipe., temporarily plug the routing pipe then remove the Case to the outdoors. This models comes with instructions for creating your routing pipe from locally available, inexpensive fittings. Note; 6 to 8 frames of bees, comb, and honey can bee heavy. You may want help removing your Hive Case to the outdoors. All Hive Cases are notched for Langstroth style deep and medium frames. For shipping charges to Alaska, Hawaii and Puerto Rico, please contact Tracey.